With proper care, your teeth can last a lifetime. But some amount of wear as we age is normal. By “wear,” we mean loss of tooth structure. 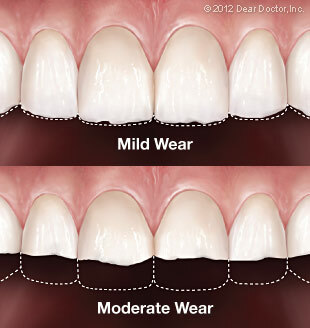 Wear starts with loss of the hard, translucent enamel that forms the outer covering of teeth, and might, in more serious cases, progress to the softer inner tooth structure known as dentin. Enamel is actually the human body's hardest substance. It is highly mineralized and non-living, in contrast to bone and dentin which are living tissues. Enamel is highly resistant to wear and chemical attack, as it would have to be given what your teeth do every day: bite, chew, and come in contact with acidic foods and drinks. Still, it is possible for tooth enamel to wear down for various reasons. Your body has ways of compensating for minor wear. But when tooth wear becomes more significant, intervention may be necessary to keep your bite functioning properly and protect your teeth. Abrasion: This is caused by the interaction of teeth and other materials rubbing or scraping against them. The most common source of abrasion is traumatic toothbrushing, meaning that you are using a toothbrush that's too hard or applying too much force when you brush. This can affect the root surfaces of your teeth just below the gum line or the enamel above the gum line. Other causes of abrasion can include improper use of toothpicks and dental floss. Some dental appliances such as partial dentures or retainers that are frequently taken in and out of the mouth can also abrade teeth. Abrasion can also result from a diet loaded with abrasive foods like sun flower seeds and nuts or habits such as nail-biting and pen-chewing. Attrition: This is an effect of tooth-to-tooth contact, which happens many times throughout the day as your teeth bite and chew food. Biting and chewing normally generate forces between 13 - 23 pounds. Yet people who have clenching and grinding habits (of which they might not even be aware) can subject their teeth to forces up to 10 times that. This can damage teeth. Erosion: When your teeth come in contact with acidic substances in your diet, the acid can actually erode (dissolve) the enamel on your teeth. Culprits of this kind of tooth wear often include sodas, sports drinks and so-called energy drinks. Certain fruit juices are also acidic. Confining these drinks to mealtimes and swishing water in your mouth after drinking them can help prevent this erosion. Abfraction: This refers specifically to the loss of tooth enamel at the necks of the teeth (the thinner part right at the gum line). While this type of wear is not clearly understood and the cause is debated in dentistry, loss of tooth structure at the neck of teeth does happen. It is believed to be caused by tooth flexion from biting forces. Abrasion and erosion can contribute to this problem. In order to treat your worn teeth, the cause of the wear must be determined during a simple oral examination at the dental office. 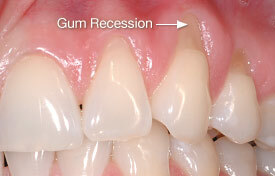 Once the cause has been identified, the stresses on your teeth can be reduced if need be. For example, you may need instruction on gentle, effective tooth brushing techniques; or some changes to your diet. If you have a clenching or grinding habit, a mouthguard can be custom-made for you that will protect your teeth during sleep or periods of high stress. Lost tooth structure sometimes needs to be replaced so your bite functions properly and your teeth look great once again. Depending on the situation, this can be done with bonding, veneers, or crowns. Fortunately, modern dentistry can restore the normal shape, appearance and function of worn teeth — beautifully and successfully!